Holmes later became one of America’s first serial killers. Mudgett is most commonly known for his brutal killer tactics in a specially constructed home nicknamed the “Murder Castle.” What flaws did he make? Who would commit such crimes? We are going to find out… Through criminology, specialists investigate the criminal’s mind, and acts of crime. What were the possible motives of H. H. Holmes and the flaws he made in his murders? Mudgett was said to be an affluent, privileged child; although, there is more evidence to look for in his childhood years to show the cause of his crimes. Holmes’ mother was said to have had a terminal illness that traumatized the family. Many serial killers encounter psychological trauma early on in their life that creates a mental disorder leading to their twisted thoughts and actions. Mudgett’s mother’s illness could have been a possible cause for his psychotic behavior. Another could be that Mudgett’s mother was unable to be saved from her illness, so he wanted to join the medical field due to his hatred of doctors. Mudgett was an extremely intelligent man, which makes him an even more terrifying figure. 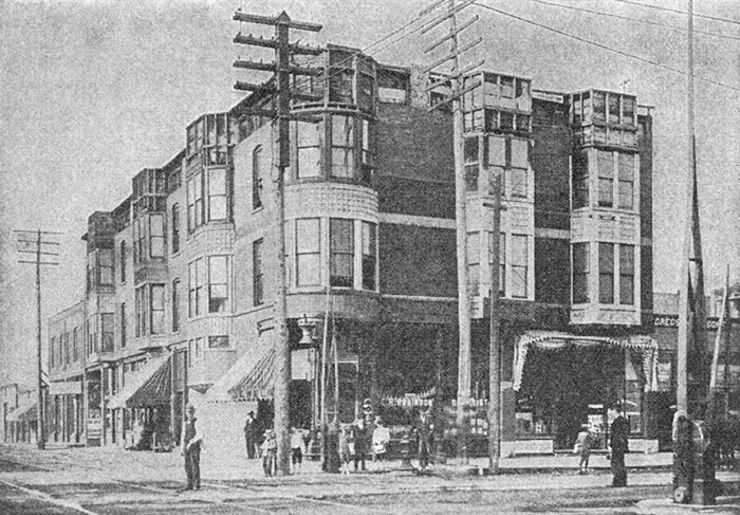 In 1885, Mudgett moved to Chicago and came across Elizabeth S. Holton’s drugstore at the southwest corner of South Wallace Avenue and West 63rd Street in Englewood, where he found work at a local pharmacy, and where he began using his infamous name, Dr. Henry H. Holmes.4 He worked at the pharmacy for about two years, and eventually took over the business. Holton said he proved himself to be a hardworking employee, and eventually bought the store. Many of these victims were women who were seduced, lured into the “Murder Castle,” and then killed. Other victims were lured there by the offer of employment.9 Holmes did not live in Chicago for long, because many people began to catch on to his trail. With insurance companies pressing to prosecute Holmes for arson, Holmes left Chicago in July 1894 to construct another “castle” along the lines of his Chicago operation.10 If Holmes would have kept out of the many building issues of the Murder Castle, he might have been able to get away with more killings in Chicago. All in all, Holmes let his impatient manner and greed get the best of him. If Holmes had been able to keep to himself, he would have been able to get away with more than he did. His motives were unclear, but the illness of his mother and his unhealthy interest in medicine have a strong correlation with the monster that was created in Chicago. Serial killers are a breed of monsters, and understanding the minds of a different breed is almost impossible. Relations and inferences can be made, but no one will ever understand why one would commit such crimes to another form of life. This article was very interesting and did a good job at delivering the information and backstory of H. H. Holmes. The backstory of him was very neat to see how the trauma when he was a child affected his whole perspective on life. Just because he had a traumatic experience and he got pleasure from killing, that does not excuse the actions that he took and the many lives that he ended. It hurts to know what traumatic experiences can do to a person. Holmes is no way excused for his actions in murdering innocents just for pleasure, but this article gave me a better understanding of what caused him to be a psychotic killer. It was interesting to hear about the infamous “Murder Castle” and how many people were foolishly lured there, making Holmes known as the first serial killer in the nation. Serial killers have been around for as long as anyone can remember. It is interesting to think about the first one ever because no one really thinks of how something so heinous began. Holmes had a “home” infamously known as the “Murder Castle” and that has to be one of the most chilling things a murderer could have. It is crazy to think that he was arrested for something completely different than murder because that’s how some people are caught these days. The Murder Castle was very interesting to hear about, and how many people were actually lured into there. It reminded me of a tv show called AHS that portrayed this idea a bit, in one of their seasons. The idea that childhood development can alter your future actions is very intersting to me, since many people do not grow up in the best way. I also was not aware that he was one of the first known serial killers, so this title caught my attention and made me want to read it. This was a very interesting article. I had no idea this was the very first serial killer. It is so interesting to me to read these types of articles and finding out why they did what they did. Mr. Holmes had a very hard childhood which most likely contributed to the motivation to take another persons life. This article was very well written. The title of this article really caught my attention, especially because, I, personally, have always enjoyed reading the stories behind serial killers and what their motive was for doing such a thing. Also, how they possibly could have done such terrible things to so many people. One thing that I have seen in the background of many serial killers, including H. H. Holmes, is that they many times experienced hardships, especially growing up and in adolescence, and I find this to be interesting. I’ve never read an article over the first serial killer, this was actually one of my favorite crime article I’ve read so far. It was very informative and well written. Mr. Holmes experienced trauma at such a young age that causes him to do the horrific actions he then did as an adult. Of course, this does not excuse his actions. Him killing a person’s entire family because of a plan that Homles had created in the first place is shocking. The article was descriptive and well-written. The information that was given was clear, accurate, and significantly important to understand H. H. Holmes. In fact, I was drawn to this article, because the title caught my attention. Although crime articles are not my favorite, this article was interesting to read. I didn’t know about the first serial killer, and his background life was significantly essential to understand in order to know what things led Holmes to kill people. Trauma can affect the perception of individuals but we can never know as outsiders how these people are affected by it, Mr. Holmes experienced trauma at a young age; this experience transcended his morals to another realm and he began to kill. With no intent, but for the pleasure of claiming someones life. Trauma does not excuse anyone from a crime, when trauma arrives, one must seek help in order to correctly stabilize there thought process.